If you follow me on twitter @liztregenza you might have seen tweets that I was going to be selling off some of the fabulous @vintagesecret (Naomi Thompson’s) collection. 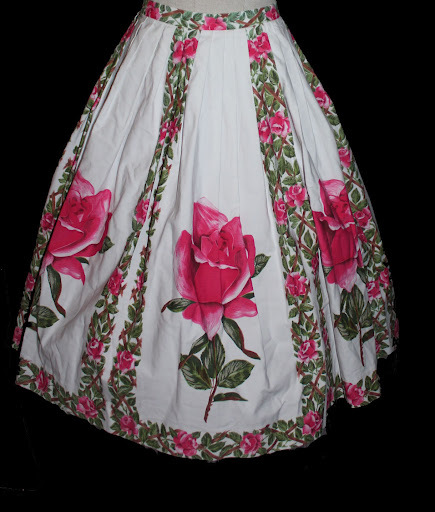 Well, I am delighted to say that at the moment I have some of these wonderful items avaialable on ebay, including a dress that was featured in her recent book Styleme vintage: Clothes. I am keeping my listings each week at the moment to distinct themes. This weeks theme is think pink. So there are lots of fab pieces from the 30s through to the 80s in pink tones. Not only are there items from Naomis collection, but some of the examples currently up on offer are from my personal collection too. With not one, not two but THREE Susan Small dreses from the 1950s. I am still desperrately downsizing, and there are lots more items coming up in the next few weeks (dresses by Alice Edwards, Blanes and Radley to name but a few). An amazing pink floral dress from my collection that is up for sale. This dress has a wonderful back detail back! If you want to know anymore about the pieces I am selling feel free to drop me an email. Susan Small began in the early 1940’s ( I think it may have been in 1941 or 2). The company was founded by Leslie Carr Jones. The head designer from 1943 onwards was Maureen Baker. Baker was proably best known for desiging Princess Anne’s wedding dress. In 1947 Susan Small joined with other design firms such as Horrockses and Polly Peck to form the Model House Group. The purpose of this organization was to pool their resources to attract new buyers to combined shows. This became the Fashion House Group in 1958, with Leslie Carr Jones as its head. The company was probably best known for their party dresses and evening wear. Susan small also had the licensing rights to produce some Christian Dior designs in the U.K., one of the most famous was the zemire dress (named after an opera by Gretry). 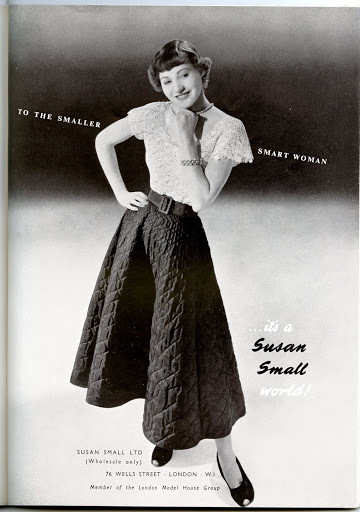 What I find very interesting about Susan Small is that it was actually designed for the petite lady (to begin with at least, as some of the advertisements here show) In the 50s Susan Small was quite an expensive brand with dresses costing you anything up to around 20gns. The garments tend to be well made, with most of the evening dresses I have found being dry clean only. 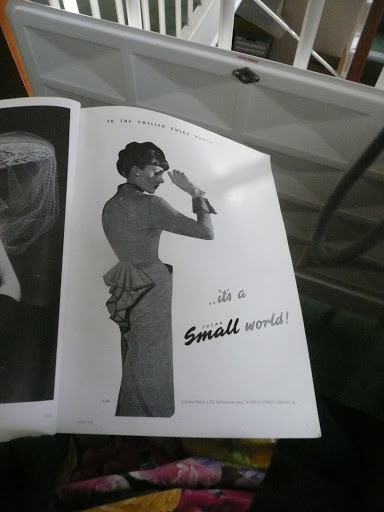 Susan Small regularly advertised in Vogue magazine. 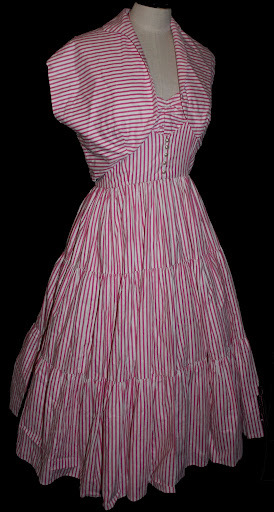 Hampshire Museum service has a large number of dresses by Susan Small (one of which is shown in a previous blog post). Here are a few of my favourite examples which really demonstrate the breadth of designs produced by the company. 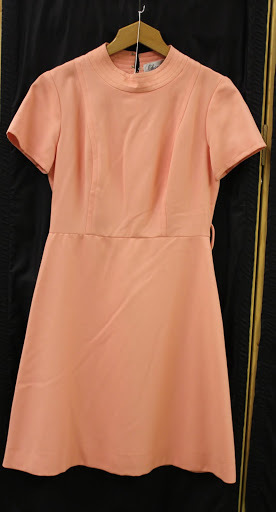 This dress is quite a casual example in a bold salmon pink. The dress is made from a synthetic fabric and dates to around 1965. As can be seen it has one of the later Susan Small labels. 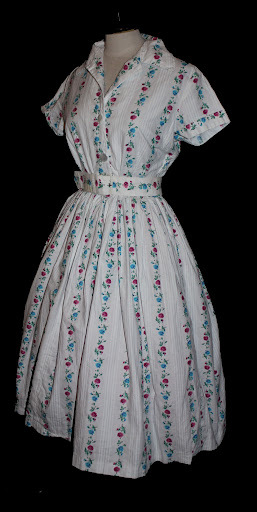 This dress was worn in 1953 to a wedding, and is a simple but stylish frock. It is made from a lightweight cotton fabric and has a zip fastening. The sweetheart neckline gives the effect almost of a bolero jacket being worn over the dress. 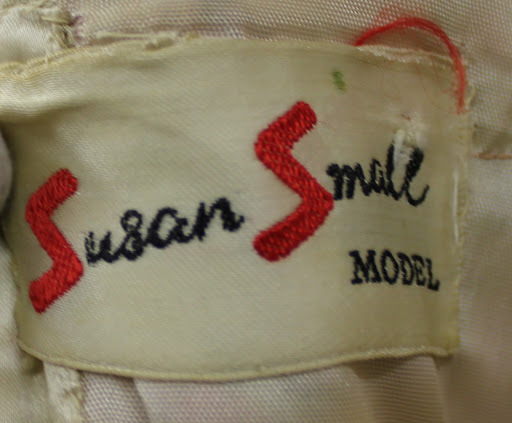 This has the earlier Susan Small label with the red font for the two S’s. And last but not least this STUNNING example. This is a real show stopper of an evening dress, excellent made (just look at the detailing on the straps!) and featuring one of my favourite (if not my absolute favourite) colour combination olive green and shocking pink. 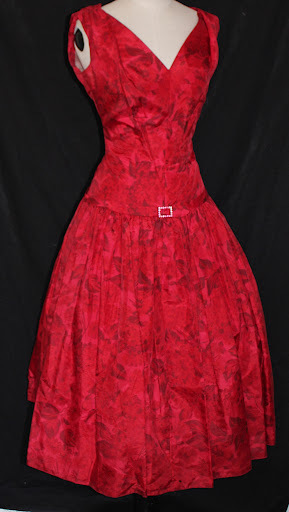 The dress dates to 1954.